“The Insult” (“L’insulte”) (2017). Cast: Adel Karam, Kamel El Basha, Camille Salameh, Diamond Bou Abboud, Rita Hayek, Talal Jurdi, Christine Choueiri, Julia Kassar, Carlos Chahine, Georges Daoud, Elie Njeim, Rifaat Torbey. Director: Ziad Doueiri. Screenplay: Ziad Doueiri and Joëlle Touma. Web site. Trailer. Oftentimes, when people quarrel, they’re not really debating about what they claim they’re arguing about. In many instances, there are issues beneath the surface that are the actual source of the conflict, most of which are far removed from the problem at hand. These proxy disputes provide a buffer against the real issue coming out, either because we don’t recognize the true root of the disagreement or because we’re not ready to deal with it. 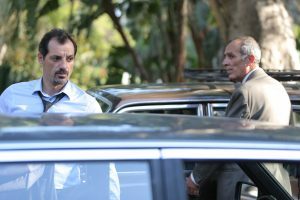 However, if genuine resolution is to come about, it’s imperative to cut through the clutter to get to the heart of the matter, an undertaking explored in the new Lebanese drama, “The Insult” (“L’insulte”). In a Lebanese Christian neighborhood of Beirut, a dispute arises when Yasser Salameh (Kamel El Basha), a Palestinian refugee contractor hired to fix building code violations, runs afoul of Toni Hanna (Adel Karam), a local resident, by repairing a faulty drain pipe extending from the occupant’s balcony. With the contractor having acted without his consent, Toni is insulted, demonstrably smashing the repair work and calling Yasser a vile name. Toni then angrily approaches Talal (Talal Jurdi), the contractor’s boss, demanding an apology. Yasser’s boss seeks to smooth things over, but Toni will have none of it until he gets his apology. Lebanese Christian Toni Hanna (Adel Karam, left) and Palestinian refugee Yasser Salameh (Kamel El Basha, right) become involved in a minor dispute that quickly escalates into a conflict with national implications in the new, Oscar-nominated drama, “The Insult” (“L’insulte”). Photo courtesy of the Cohen Media Group. Not long thereafter, Talal encourages Yasser to give Toni what he wants. He informs Yasser that there’s more at stake than his pride, including the prospects of future work. And so, Yasser reluctantly agrees to meet with Toni for a street-level summit organized by Talal. However, when the combative parties meet, Toni’s hatred becomes obvious, prompting Yasser to pull back from his promise to apologize. As the tension mounts, Toni lets loose with a racially charged disparagement of Yasser’s Palestinian heritage, an insult that could be construed as a hate crime. Toni’s words anger Yasser so much that he punches his opponent in the stomach, breaking several ribs and necessitating a hospital visit. The conflict lands the two men in court before a judge (Carlos Chahine) who has little patience for the combatants. When he asks each party for specific evidence about their contentions, they either hedge their answers or refuse to divulge what they know, prompting the judge to dismiss the case and acquit Yasser. Palestinian refugee Yasser Salameh (Kamel El Basha, center) has his day in court with representation by his young, idealistic lawyer, Nadine Wehbe (Diamond Bou Abboud, right), in the gripping Lebanese drama, “The Insult” (“L’insulte”). Photo courtesy of the Cohen Media Group. Unsatisfied, however, Toni presses on, appealing his case to a higher court and hiring one of the Christian community’s most prominent prosecutors, Wajdi Wehbe (Camille Salameh), to represent him. In turn, Yasser retains a young lawyer, Nadine Wehbe (Diamond Bou Abboud), an idealist who happens to be Wadji’s daughter and who strongly believes that Palestinian litigants don’t receive fair treatment in the Lebanese judicial system. Presiding over the case is a panel of three judges led by chief justice Collette Mansour (Julia Kassar), who intends to maintain a tight leash over proceedings that obviously have the potential to get out of hand, especially now that the dispute has begun to receive increased public attention. Outside of court, circumstances quickly begin to spiral out of control. Issues arise involving the plaintiff’s health, which runs into complications during his recovery, and his relationship with his pregnant wife, Shirine (Rita Hayek), who subsequently develops serious obstetric challenges. On top of that, the case soon becomes a media circus, with racially charged sentiments spilling over into the streets, leading to protests, heated arguments and even riots, events that trap innocent parties in the crossfire. Meanwhile, inside the courtroom, the ante is continually upped, especially when the parties’ counselors introduce evidence and conduct lines of questioning that delve into the litigants’ personal histories and backgrounds. These tactics, though somewhat questionable, nudge the real issues at the heart of their conflict to the surface, most of which have causes that extend back far beyond their misunderstanding about the drain pipe, some of which are rooted in the combating parties’ experiences in the Lebanese Civil War. With these issues exposed, painful memories emerge, with anguish that becomes exacerbated when Toni and Yasser see what their skirmish is doing to their country, opening old wounds and threatening to make them worse – for everybody. Quietly, the litigants begin to reconsider their positions, but, publicly, even the heartfelt reconciliation pleas of a prominent politician (Rifaat Torbey) seem to go unheeded as the country descends deeper and deeper into chaos. A legal dispute strains relations between Toni Hanna (Adel Karam, right) and his pregnant wife, Shirine (Rita Hayek, left), in the new Lebanese drama, “The Insult” (“L’insulte”). Photo courtesy of the Cohen Media Group. Will Lebanon save itself before tearing itself apart? Will the quarreling parties get to the root of their disagreement and resolve it, setting an example for their increasingly contentious countrymen? Or is the nation’s fate irretrievably sealed, becoming yet another casualty of the uncontrolled, inflexible emotional and political sentiments sweeping across so many countries these days? This is a potent cautionary tale with implications that can be writ both large and small, given that the bedrock on which they rest is the same in both cases – and just as shaky in each instance. To realistically solve these issues, Toni and Yasser must take a good hard look at their beliefs, for they drive the conscious creation process, the means that forms the basis of their respective realities. And this is true whether or not each party fully recognizes the authentic nature of those beliefs, a circumstance that can prove to be quite problematic when those underlying intents involve volatile matters, as is very much the case here. Given that their conflict appears to be rooted in beliefs that originated in the past, their current situation clearly demonstrates the power and persistence of these notions. It’s as if the beliefs are operating on autopilot, subtly but continually manifesting conditions related to their nature, no matter how beneficial or detrimental they may ultimately be. And, as becomes apparent as the film plays out, they carry the potential for reigniting old hatreds and inciting a new round of troubles, issues that the country had thought (or, more precisely, would like to have thought) it had put behind it. With a minor civil dispute that gets out of hand, litigant Toni Hanna (Adel Karam) must do some serious soul-searching when the conflict begins to have national implications in the Oscar-nominated Lebanese drama, “The Insult” (“L’insulte”). Photo courtesy of the Cohen Media Group. If circumstances are ever to change, Toni and Yasser will need to begin with changing their beliefs, not just for themselves, but also for the Lebanese population. In many ways, the conflict between the two combatants is metaphorical of a larger, national problem, a microcosmic materialization of beliefs that have gone unrecognized and unaddressed for a long time, despite recent events. The scenario depicted here also illustrates the power of co-creation at work. Even though the fight begins with two individuals, it quickly escalates into a melee involving a much larger contingency, with each participant contributing his or her energy and belief support to the unfolding drama, be it knowingly or unwittingly. Again, if resolution is to occur, a change in beliefs is in order, though this time on a much larger scale. Change is possible, though, as long as the parties to this dispute – both personally and collectively – are willing to make the effort to analyze what’s driving their existence and to consider previously untried options for altering their reality. This takes thinking outside the box, pushing past preconceived limitations and devising inventive solutions that can bring about meaningful and acceptable resolution. It would seem that all parties involved have their work cut out for them, but, given that conscious creation makes all probabilities possible, a solution is by no means out of the question. If more of us were to take such an approach in both our personal and public disputes, we would almost assuredly have considerably fewer problems in the world today. 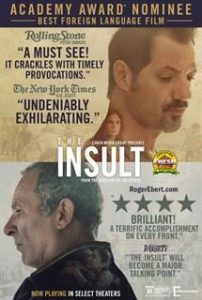 Though sometimes a little shrill and overly dogmatic in its tone and a little formulaic in its narrative format, “The Insult” nevertheless serves as an effective metaphor for many of humanity’s ills these days. Excessive polarization, a desire for vengeance rather than justice and an unwillingness to compromise all take front-row seats in this drama about the sometimes-futile quest to find balance and reconciliation when those qualities are virtually nonexistent. A knowledge of Middle Eastern history and politics would certainly help aid the viewing experience of this film, but, even with not knowing all the details, the essence of the conflicts – and the picture’s central message – still come through loud and clear (sometimes a little more so than one might want). Yet, for its efforts, the picture has received an Oscar nomination for best foreign language film. As this film illustrates, it would be in our best interests to face up to what the real issues are in our lives, be it on a personal or national scale. To put it off only prolongs the pain and the length of the resolution process. But it’s not impossible. “The Insult” shows what it means to make the effort and to search for a solution before the pot boils over.